HOUSTON (CN) — A year ago this week, Houstonians anxiously watched as their city — a sprawling mosaic of urban high-rises and residential neighborhoods and home to nearly 5 million people — became a murky sea of rainwater and debris after Hurricane Harvey dumped 33 trillion gallons of water in a week. Today, the Harris County Flood Control District is preparing to implement a $2.5 billion bond to combat floods over the next 20 years. Houstonians overwhelmingly approved the bond Saturday, though only about 150,000 people voted on the measure. The bond measure will cost taxpayers two to three cents per $100 of home value. Lawmakers tied the vote to the hurricane’s anniversary, rather than putting it in a regular election cycle, which likely depressed turnout. The bond will provide local matching of federal funding from the Federal Emergency Management Agency (FEMA) and the U.S. Department of Housing and Urban Development (HUD). 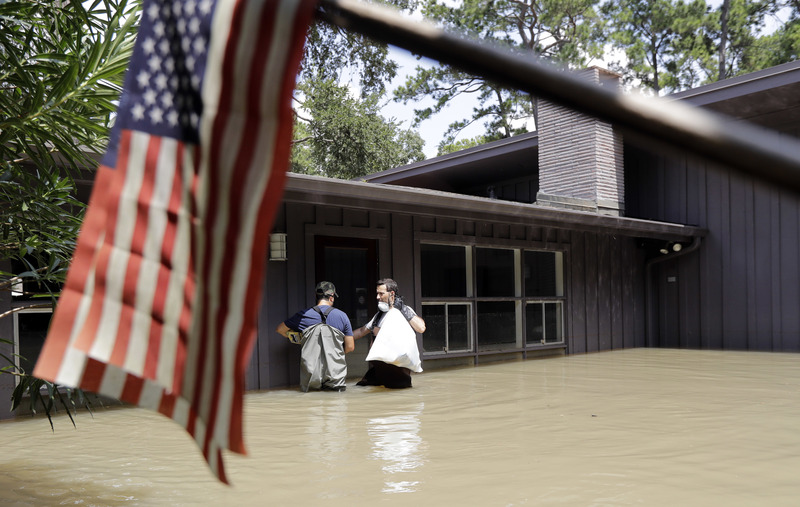 A series of floods in Houston in the past 17 years, including Tropical Storm Allison in 2001, the “Tax Day Flood” in 2016, and Hurricane Harvey magnified infrastructure problems that the city, county and federal authorities have struggled to mitigate. For example, the 100-year and 500-year floodplain maps, the metric that authorities use to track flood trends, has been rendered obsolete due to the frequency of severe flooding, according to an analysis from Rice University professors Jim Blackburn and Philip B. Bedient, with the Severe Storm Prediction, Education, & Evacuation from Disasters (SSPEED) Center. The professors’ analysis found that the last three severe flood events have exceeded those metrics — aggregate rainfall during Harvey was more than double that of the 500-year rainfall record. A 500-year flood event has a 0.2 percent chance of happening in any given year. In April this year, the Houston City Council approved new building mandates that require real estate developers to build structures 2 feet above the 500-year flood plain. However, as the SSPEED analysis indicated, using the 500-year floodplain may not be enough to prevent widespread property damage. As also noted in the analysis, flood predictions are not being factored into mitigation efforts, which is a problem because the record-breaking rainfall amounts are not just increasing in frequency, but also in severity, due to climate change. “(W)e should consider how to get ahead of this issue, something we can only do if we stop arguing about whether or not the climate is changing and instead start analyzing and understanding this serious problem,” the Rice University report states. In addition to problems associated with floodplains, watersheds for Houston’s various creeks presented more perils for homeowners. During the storm, the Army Corps of Engineers and the flood control district were forced to release water from the overflowing Addicks and Barker Reservoirs straight into residential areas. The move compounded flooding from the storm, but officials deemed it necessary to preserve the structural integrity of the reservoirs. The Corps of Engineers classified those dams in 2009 as “almost certain to fail under normal operations within a time frame from immediately to within a few years without intervention,” according to the professors’ report. A flood-reduction project for Brays Bayou, which flows from western Harris County through south Houston neighborhoods and empties into the Houston Ship Channel, illustrates the difficulties of flood management. Gary Zika, federal projects manager for the Harris County Flood Control District, said the post-Harvey focus on finishing flood-control projects quickly must be tempered by logistics. “Project Brays has been in active construction for 18 years, and we’ve moved 23 million cubic yards of dirt in the Brays watershed. One dump truck you see driving down the street is 7 cubic yards; that gives you an idea of how much work we’ve done and how long it takes to do the work,” Zika said. He said the district has spent $350 million on Project Brays and the Corps of Engineers has reimbursed $200 million. Bond funds will help pay for the final phase of project, which the flood control district hopes to finish by 2022. Climate change has also put a damper on the project, according to the Rice University professors’ report. Though it’s estimated Project Brays will take 15,000 homes in the Brays watershed out of the 100-year flood plain, experts say that once the National Oceanic and Atmospheric Administration updates its 24-hour rainfall levels for 100-year storms, the homes will be back in the flood zone. There is a 1 percent chance of a 100-year storm in any given year. Under NOAA guidelines, the 100-year storm for Brays Bayou is 13.2 inches of rain within 24 hours. But the agency is expected to raise the amount for that time period to 16 to 17 inches. NOAA plans to release the updated numbers by 2019. Zika said The Harris County Flood Control District, with funding from FEMA, will then use the new 100-year storm figures to draw new flood maps. Charles Goforth is president of the Brays Bayou Association, which represents 30,000 homes in the Brays watershed. Goforth, a realtor, said that 1,600 former members of the association either sold their homes, or do not plan to move back to the area. Many of those staying are having their homes elevated, and were doing so even before Harvey hit, he said. The flood control district and local authorities plans to shore up these reservoirs via the bond program, which will provide more than $278 million for just the Addicks Reservoir projects. The two most expensive projects for the reservoir will focus on improvements to drainage systems in adjacent subdivisions, which struggled to keep up with the weeklong torrential downpour, as well as land purchases and construction costs for a new water retention pond just west of the Addicks Reservoir. One neighborhood affected by both upstream watershed issues and the Addicks and Barker Reservoir releases was Bear Creek Village on the east side of Bear Creek Park. Bill Cook, a longtime Bear Creek Village resident, said in an interview last week that another water mitigation problem besides the Barker and Addicks Reservoirs was a watershed bottleneck on Langham Creek that caused upstream backups right into his subdivision. Cook said parts of Langham Creek were full of vegetation and debris that choked off water flow, but the Corps of Engineers refused to let local authorities clear the creek due to endangered wildlife in the area. Cook said the Corps of Engineers was more focused on studying long-term flood issues, rather than seeking practical solutions that could benefit residents before the next flood. 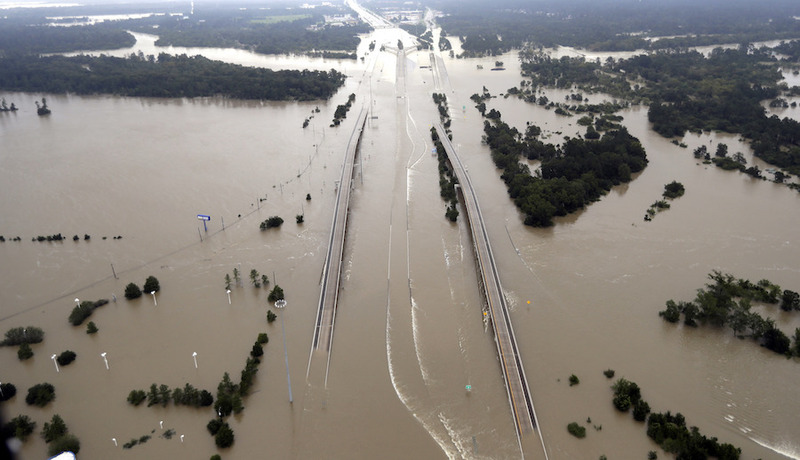 Like the Addicks and Barker Dams, two reservoirs that impound the San Jacinto River and supply drinking water to Houston were blamed for worsening Harvey’s destruction. 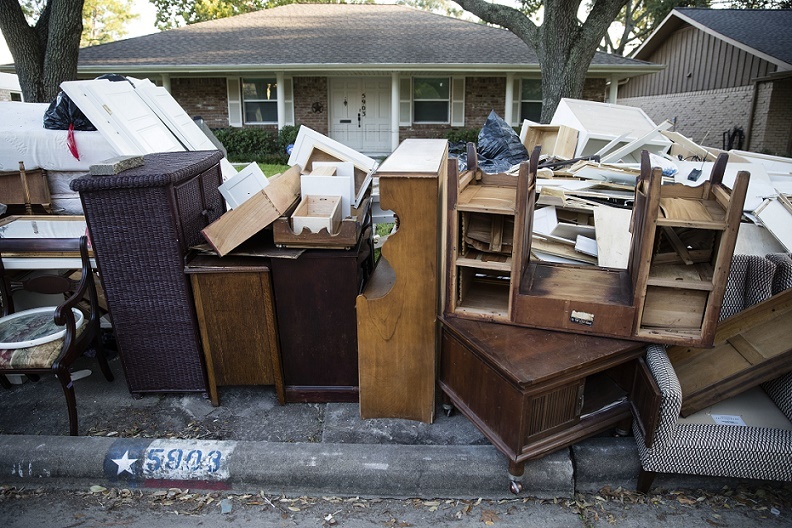 In north Houston suburbs between Lake Conroe and Lake Houston, federal officials estimate 16,000 homes and 3,300 businesses were flooded during the storm. The San Jacinto River’s west fork flows into Lake Houston, 15 miles northeast of downtown Houston, the city’s main source of drinking water. In more than a dozen lawsuits in Harris County Court, homeowners say the San Jacinto River Authority flooded their properties when it released a record 79,000 cubic feet per second from Lake Conroe on Aug. 28 last year to prevent the water from frying electrical outlets in docks and other lakeside structures. The release washed out sediment that piled up in a huge sandbar in the west fork of the San Jacinto River, blocking drainage ditches and reducing the river’s capacity to drain floodwaters. The Corps of Engineers in early July awarded an Illinois company a $69 million contract to dredge and remove 1.8 million cubic yards of sediment from the river: enough to fill the Astrodome two times. “My hope for the dredging is that it will save the community. I really believe that if there is the risk of flooding again, you will start to have abandonment. Businesses that have gone through this before will decide not to do it again,” Amy Slaughter, resident of the Kingwood subdivision told the Houston Chronicle. Most businesses in the area survived Harvey. 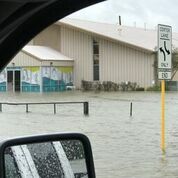 Of the 3,300 affected, flooding closed 300 temporarily and 85 percent of those have reopened, according to the Lake Houston Area Chamber of Commerce. The project is scheduled to start Sept. 1 and end in April. Since the contract only authorizes the Corps of Engineers to make the river how it was before Harvey, critics warn that without yearly maintenance dredging, the sediment will quickly build back up. The city on July 27 applied for $48.5 million in independent grants from FEMA to add 10 floodgates to the four already in the Lake Houston dam. The bond will fund the remainder of the estimated $70 million price tag. The new gates will help reduce flooding by rapidly lowering the lake’s water level before storms hit. In addition to the flood mitigation projects within the City of Houston and outlying neighborhoods, Texas is seeking $12 billion in funding to go toward a coastal “spine” of concrete walls, dirt and sand barriers, floating gates and steel levees, in an effort to combat coastal flooding problems and changes in sea level associated with climate change. The proposed project would protect refineries along the Gulf Coast, stretching from Louisiana to Houston, which make up 30 percent of the United States’ oil production capacity. In the wake of Hurricane Harvey, lawmakers and the public must reckon with storm mitigation systems that were unprepared for what some called “Biblical” flooding.